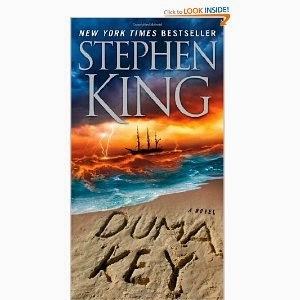 The Writing Bug: A Writing "Geographical"
Recently I read the novel Duma Key, by Stephen King. It’s a story about a contractor, Edgar Freemantle, who has a horrible accident when his pickup truck tangles with a crane (a no-win scenario for the truck) and he loses his right arm, part of his memory—mostly for words and phrases, and then his wife, who divorces him after 25 years of marriage. On the advice of his therapist, he decides to try a “geographical.” This means he goes to live somewhere new, far away from his home in St. Paul, Minnesota on an island called Duma Key in Florida. He signs a lease for a house called “Salmon Point” which he refers to as “Big Pink.” Here he begins to sort through his “previous life” in order to prepare for his “second life," though he still doesn’t know what that will be when he arrives on Duma. Eventually he learns that he is an artist; that becomes his second life. This story got me thinking about the annual vacation my husband Jim and I take each year to the boundary waters of northern Minnesota. It is our “geographical.” You don’t have to suffer terrible trauma to know that relocating for short periods of time can re-set your priorities and re-establish some balance in your life. It always seems to do that for me, and I know it does for Jim too. We stay in a cabin at a wonderful place called Cross River Lodge for five weeks each summer. We tell ourselves that we mainly want to get away from the oppressive summer heat of southeast Kansas, but we both know it’s more than that. This is the place where I catch up on my reading—and my writing. I think about my writing priorities and projects for the coming year. Then I actually spend some time working on those projects. Because it is there I have the luxury of writing for long stretches of time. And writing for long stretches is an important part of re-establishing balance in my life. I love northern Minnesota, in fact i have kind of a romantic notion about packing up all my things and moving there. I can't imagine a more wonderful place to visit for your geographical. I think we could all use a writing geographical once in a while. This is an interesting post. I'd love to have my geographical at Harry Potter World in Orlando. I think my imagination would run wild there. Minnesota is wonderful. And you should do it! I know life is complicated, but plan ahead, make it happen! If you want some information about the area, please let me know! Thanks for your comment, Abbie! Have you been there? I was at a conference in Miami in November of 2012 and took a day to go to HP World. My husband, also a fan, went too. A great time! Can you see yourself sitting in the Three Broomsticks writing for an afternoon?